(NaturalNews) In light of the Senate's recently passed GMO fake-labeling bill, giving food manufacturers voluntary responsibility to label their products' GMOs, Alaskans received an additional blunder. Republican Senator, Lisa Murkoswki, took to the Senate floor on July 7 to discuss her concerns with the Senate's recent approval allowing food companies to manufacture and sell genetically engineered salmon in the state of Alaska without providing clear, transparent GMO labeling. Prior to the recent approval of the Monsanto-backed GMO fake labeling bill, Alaskan law required labels on all products containing genetically engineered salmon. As laid out in the Biotechnology Labeling Solutions Act, the new legislation "would allow the Agriculture Department to determine which foods qualify as genetically modified and let companies choose the method of disclosing genetically modified organism (GMO) ingredients to consumers." This marks the first time in history that the FDA signed off on allowing the production and sale of a genetically engineered species designed specifically for human consumption. Alaskans calling genetically engineered salmon "Frankenfish"
To make this GE salmon, scientists are taking DNA from an ocean pout, a type of eel, and combining that with DNA from a Chinook salmon to produce what many Alaskans are calling a "Frankenfish." While the FDA has reassured concerned Alaskans that the voluntary labeling stipulations of the recently passed bill will be enough to ease their worries, Alaskans are not convinced. 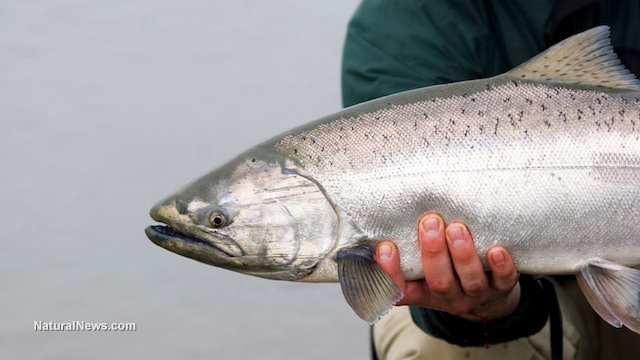 Alaskan Senator, Lisa Murkowski, voiced her concerns to the Senate last week over the approval of voluntary labeling stipulations for this genetically engineered salmon. "My opposition here is to anything that would mistakenly allow genetically engineered salmon into anyone's home and have it mislabeled as salmon," Murkowski said. Alaskan citizens have voiced their disapproval as well, as over 1.5 million of Alaska's population wrote the FDA detailing their unified opposition to the bill. Additionally, numerous Alaskan grocery stores, including Safeway, Kroger, Whole Foods, Trader Joe's, and Target, have announced they will refuse to sell genetically engineered salmon without mandatory labeling requirements. Not only does this pose huge health concerns for Alaskans, as they will not know whether the salmon they buy at the grocery store is true, wild Atlantic salmon or if it is some genetically engineered "Frankenfish," it also poses an enormous threat to Alaska's seafood industry. Providing more than 63,000 jobs and contributing over $4.6 billion to the state economy, Alaskan fisheries play a critical role in the maintenance of the state's overall livelihood. Under the stipulations of the FDA's approval for aqua bounty technology last November, these genetically engineered salmon eggs will be produced in Canada, and then shipped off to Panama to be raised in pens, providing no benefit to the American economy, let alone the Alaskan economy. Senator Murkowski spoke of the grave dangers this poses to the Alaskan economy, claiming GE salmon "has the potential to wreak havoc, to do harm to our natural stocks ... [and] poses a serious threat to the livelihood of our fisherman." As a result, Senator Murkowski is pushing for the approval of an amendment to the recently passed non-GMO labeling bill requiring the FDA to create a new market name for GE salmon, but has been met with strong opposition. "We will not accept that ge salmon, or this Frankenfish, be sold to us without clear labeling," Murkowski told the Senate last week. As Alaskans remain united in their opposition to the sale of unlabeled GE salmon, Senator Murkowski is doing everything she can to be make sure the voice of her people is being heard. Wild Alaskan salmon provides a myriad of tremendous health benefits, providing a natural source of lean protein, Omega 3's, vitamin B6, vitamin B12, and niacin. It would be a shame to see a nutrient depleted, genetically modified "Frankenfish" be sold alongside true Alaskan salmon as one in the same.